At left, Charlotte junior, Elijah Reyna (middle) has his broiler judged at the 2019 ACLS. It’s that time of the year for the 2019 Atascosa County Stock Show. Charlotte’s FFA has the opportunity to go against other schools to show off their animals and mechanical projects. For the third year in a row, junior Joshua Reyna will show his hard work and dedication with his broilers and swines. At a young age, Reyna has always enjoyed taking care of animals, and since then, knew he wanted to be an FFA member to show animals. “For younger students who are beginning to show animals, don’t give up and do the best that you can,” said Reyna. At the age of 16, sophomore Lucy Benavidez became interested in showing chickens for this year’s show. The ability to see how much they grow is what Benavidez enjoys the most. She also thinks that chickens are cute to show and loves how she can put her hard work into showing them. “My favorite part is building a connection with the animals, before I eat them,” said Benavidez. Good luck to all Charlotte FFA members competing in their events this week. Watch live coverage of the 2019 ACLS on the Pleasanton Express Facebook page and see results in the next three issues. 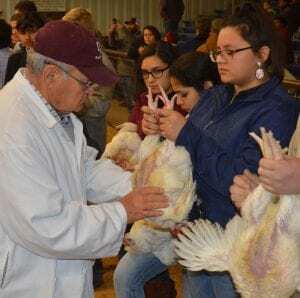 Lucy Benavides has her broiler judged during the 2019 ACLS on Tuesday.